In this video we will build a backline based on logic. Establishing firstly a base combination between 9 and 10, which is hugely important for a backline to function and then looking at the roles of the rest of the backs. Giving us a backline with real rhythm and timing. Good to see Lima at 9. Would liked to have seen passing off the left hand as well, but the building start and receiving points was excellent. It does take time to build god habits. Really good teaching in this video, not just the actual skills, but the style in which Wayne asks questions of his guys. Even includes a young Julian Savea! This is a great demonstration of how the most up-to-date attacking structure works, i.e. a shallow alignment of the backs closer to the gain line, putting more pressure on the defense. The idea of a steep backline at roughly a 45 degree angle has gone the way of the dinosaurs. This structure, emphasizing straight-line running and quick ball movement needs to be introduced to players at the younger age groups so that they don’t need to be retrained after being taught the steep back alignment by “old school” coaches. I think these first wave of Rugbysite videos are the classics as they are grounded in game-based learning and conceptual understandings. Th newer videos tend to be, shorter, mostly technical and separated from a games based approached. I wonder why the RugbySite strayed from its original unique framework? So many key points from this video yet simple answers as to why players are or aren’t in position and consequently overrun player in front of run sideways, excellent delivery of what is often difficult to identify in players. Common sense and fundamentals – my favorite way to introduce the game appropriate for all levels. The only thing that changes in the distance as your move toward a younger side. Very effective approach to setting up your back line depending on your players abilities and line speed of the opposition. 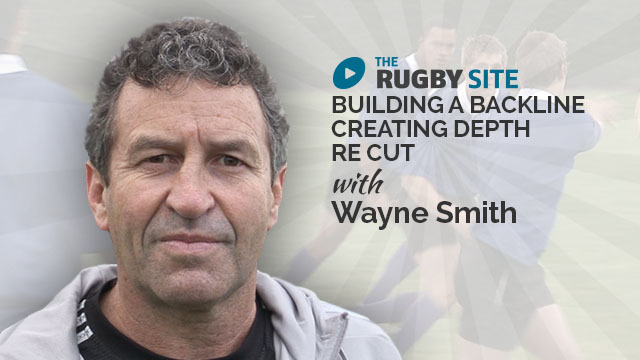 Wayne Smith lays out an excellent but simple set of back line drills, which will help players to read opposition defences and organise back line attack play accordingly. so simple but affective , good stuff ! I loved this info and great to see some young rugby stars. Could this video please be cut up for each progression as I ended up watching it all which was too much info at once for my brain. Cheers. This is a fantastic drill, I was having problems with spacing between 9 + 10 but this will go a long way to fixing that. Superb coaching tip. Really enjoyed it, coach kept it simple and easy to understand. Thank you. Really excellent and a good visual demonstration of some of Jim Greenwood’s backline principles. great demonstration of how to put on a backline, very clear and easy to understand .. thank you .. I agree with the staggered depart and each player having a trigger, but in the drills with the three different starting points for the defence the attacking line is so focused on getting the ball to the outside that they no longer move forward effectively. im having a real problem watching any videos tonight, every one i have tried to watch has frozen on me what is the problem. Another fantastic demonstration from Wayne, if I could only aspire to these quality demonstrations, I try, maybe one day. His clarity of explanation and objectives achieved, a true masterclass, thank you. Just what I’ve been looking for !! It’s a joy to watch such excellent coaching delivered in a calm and specific way. Im delighted to have found your site and looking forward to watching many more sessions. Genius way to organise the depth of your backline. Easy to follow, challenging and effective. Really simplisic but effective stuff, I’ll will attempt this with my backline this week, as sometimes we over run attacking ball. The triggering of the players run is probably the most difficult for individuals to grasp. I will review this and report back on the success…..